I always make it a point that I am the one who prepare for my daughter's snack for school. Its either sandwiches or sliced hotdogs or some biscuits. I don't allow her to bring money to school, not unless she have to pay for something. But these past few days, my Nanay started giving her coins of small denominations, 1 peso and 5 peso coins. Little girl is always happy every time her grandma gave her coins. She gets to buy a piece of pastillas. Her latest favorite. 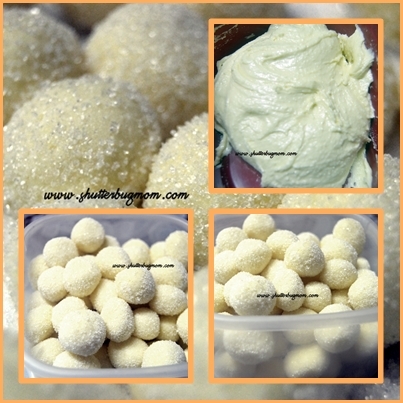 Pastillas de Leche are sweet milk candies that are usually served for dessert. An authentic recipe will require the use of Carabao's milk (water buffalo) and cooking is also necessary. But what I have here is a no-cook recipe. I found this easy-to-make-no-cook pastillas recipe online. Wrap the pastillas in a cellophane or food paper. *If you don't like wrapping, shape into balls and insert a toothpick at the center. After finishing this, someone's really happy to see lots of yummy pastillas balls.